A multi-agency investigation led to the arrest of two people in Sisters in connection with alleged illegal manufacturing and sale of marijuana. On the afternoon of Thursday, October 11, members of the Central Oregon Drug Enforcement Team served a search warrant at 17521 Forked Horn Dr. in Sisters. According to law enforcement, the action was part of an ongoing, long-term investigation. Members of the Central Oregon Emergency Response Team (CERT) assisted with the execution of the warrant. 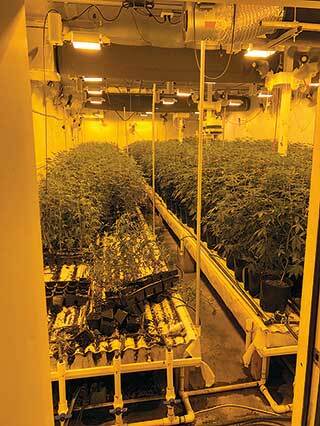 A law enforcement statement reported that, "A large, sophisticated indoor marijuana grow was located on the property which was contained in both a large metal pole building as well as within the primary dwelling on the property. A large, sealed structure had been built within the large pole building and was complete with an air filtration system, a self-watering system and also climate control features." Police seized 4,368 marijuana plants in various stages of growth, 196 pounds of dried marijuana and four pounds of BHO (Butane Hash Oil). "The marijuana grow lacked any current permits authorizing the growing of marijuana at the Forked Horn address for either medical or recreational purposes," police reported. Shaun Gutta and Krystal Silverio, both occupants of the Forked Horn address and present during the execution of the search warrant, were arrested on multiple charges involving possession, manufacture and distribution of a controlled substance. Both were transported to the Deschutes County Sheriff's Office Adult Jail where they were booked and lodged. Police report that evidence gathered during the investigation supported information that Gutta and Silverio were exporting marijuana product outside of Oregon. The CODE Team also investigated and took action on two other marijuana growing operations, one in Redmond and one in La Pine, and stopped a Penske moving truck connected to the La Pine operation, seizing 957 pounds of dried marijuana, 66 pounds of BHO extract, over eight pounds of marijuana concentrate and three BHO/concentrate labs. While marijuana use and licensed growing are legal in Oregon, exporting out-of-state is not. The CODE team is a multi-jurisdictional narcotics task force supported by the Oregon-Idaho High Intensity Drug Trafficking Area (HIDTA) program and the following Central Oregon law enforcement agencies: Oregon State Police, Bend Police Department, Deschutes County Sheriff's Office which includes a Proactive Marijuana Enforcement Detective funded by the Deschutes County Board of County Commissioners, Redmond Police Department, Prineville Police Department, Crook County Sheriff's Office, Jefferson County Sheriff's Office, Madras Police Department, Sunriver Police Department, Black Butte Police Department, United States Drug Enforcement Administration (DEA), Federal Bureau of Investigation (FBI), Warm Springs Tribal Police Department, Deschutes, Crook, and Jefferson county district attorneys, and the Oregon National Guard.